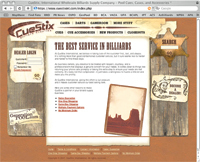 Enter CueStix to whisk yourself back into the days of the wild, Wild West. We enjoyed the experience of exploring pool products on a western-themed site (bordered with distressed wood and a sheriff's badge) and easily finding all the sections we expect in a vendor site. As a wholesaler and distributor, CueStix sells products from many different manufacturers and brand names to retail establishments. So, the consumer can't buy anything directly from this site, but there is a wealth of information on most products, as well as a method for new dealers to establish a relationship with the company. Imperial lets you customize your own table with a wizard - including body style, pockets and cloth - and provides a short form so the company can send a quote for your creation. You can also build a table with licensed imagery from NFL, MLB and NBA teams. In searching for a dealer by zip code, the in-depth results include small thumbnails and a key to let you know what kind of products the nearby stores carry. It's a great function. Imperial also offers an interactive feature showing how the company constructs its tables. While the Imperial site offers unique features, it has two serious flaws. First, in a recent visit, an error message popped up whenever we selected a billiard table from its collection. Second, when we clicked Cuetec in its menu, we received an Under Construction message. No site should have this. If something isn't ready for prime time, leave it off. 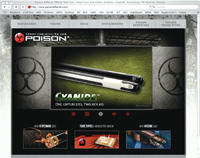 Poison Billiard's sleek site takes advantage of its "toxic" brand name and all that entails. The symbol for hazardous materials is integrated into the design of the site, and the overall atmosphere is at once clinical and noxious. Despite missing an "About" page, the site won us over with its humorous content - for example, playing off the names of its cues, like Anthrax and Cyanide. As a vendor/manufacturer, Poison sells its products to retailers and dealers instead of the public, so dealers can register here to become a legal Poison dealer, while buyers can locate one and register their products. You can download contaminated wallpaper, play a short pool game with booby-trapped balls, or sign up for a steady dose of Poison through a newsletter. We would've liked to see a sample of the newsletter, so we know what to expect as a subscriber. We survived our tour of the site and can attest it's safe to visit. 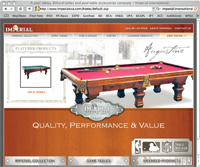 Brunswick Billiards has a long history in our industry, which is amply reflected on the firm's site. One section (accessible through the stylish navigation bar up top) includes the company's story, complete with pictures of vintage ads and posters. We loved browsing the gallery of antique tables. Visitors interested in a new table can build a table and design a gameroom with the detailed space-planner tool. Unlike many other vendor/manufacturers who treat their Internet sites like a copy of their catalog, Brunswick considers the viewing experience. 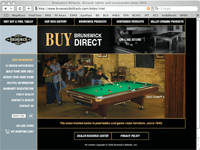 Every product on Brunswick Billiards has its own page, complete with details and images optimized for the Web. One complaint: The site uses drop-down menus that force you to select a sub-menu item instead of clicking on the header to go to a separate section devoted to the topic. Anyone can buy products from the online retailers, but not every online store does a good job of presenting its many products in an organized and tasteful fashion. Many overwhelm visitors with too much information and too many menu choices. On its understated site, Border Billiards only has three choices in its top navigation (Home, Info and Shopping Cart) - unusual for this category - and divides the sidebar menu into three main categories: Shop, Specials and Resources. 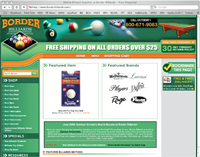 Border Billiards covers shipping details and provides often-overlooked background information about the company. Its catalog of products doesn't look like it tried to copy a printed catalog, as many sites do. The whole design scheme helps visitors' eyes find what they need without working hard. 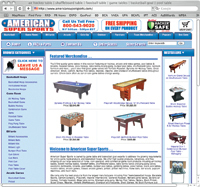 Although American Super Sports lists many tabs and navigational items, it provides visual cues through bold and larger headings and boxed sections for the featured merchandise and bestsellers. A little less noise from the navigation and it might have been the winner. The site's FAQ, contact information, order status, and search menu appear right at eye level. Every page contains answers to the typical questions people ask when visiting a retail site regarding store policies, security protection, contact number and support hours, as well as shipping details. American Super Sports has almost everything needed in an online retail store except for an "About" page. It could stand a little more color and fewer navigational items.